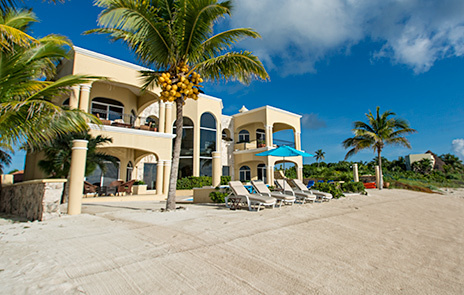 Located on the sandy shores of Tankah Bay, Villa Paloma ahs the largest pool on this bay! 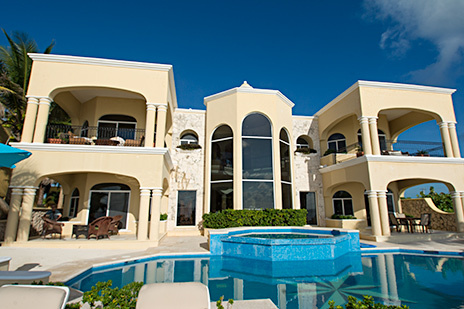 Villa Paloma has the largest swimming pool on Tankah Bay; multi levels, too! Max. 8 adults, 2 children. 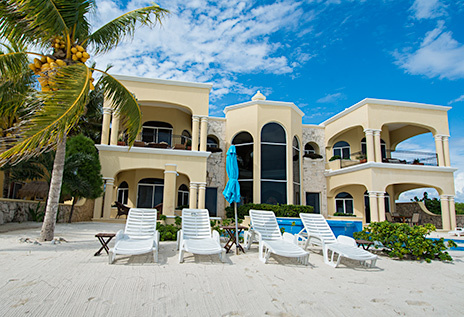 More on Villa Paloma . . . Here's a slice of paradise on the white sand beach of Tankah. 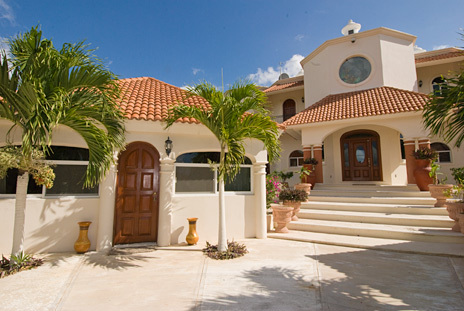 Casa Paloma is a deluxe villa with a breathtaking view of the Caribbean sea. 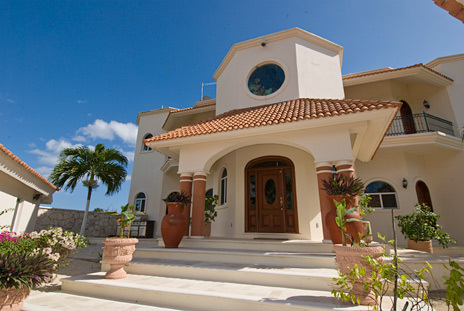 Casa Paloma is a striking villa from every angle. You'll be impressed with the garden and driveway to the property. 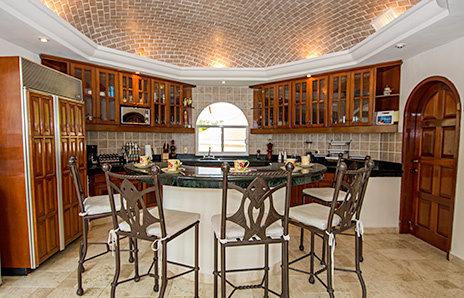 Inside is a dream with domes, arches, stain glass and intricate ironwork. 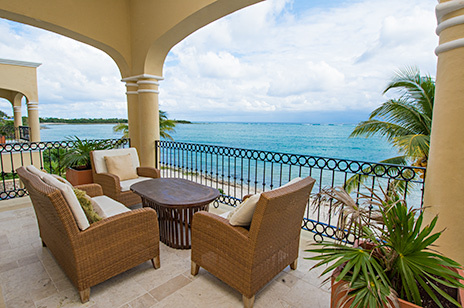 Views are incredible from inside the villa and its multiple terraces. 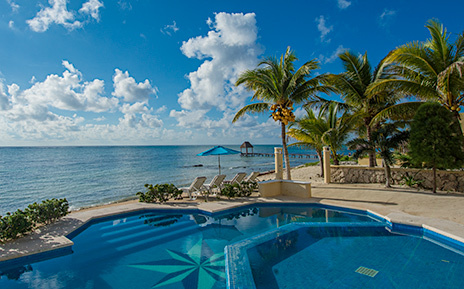 The pool and oceanside of the villa is remarkable. 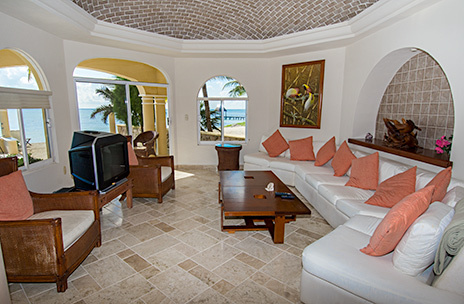 Casa Paloma definitely stands out among the villas along this bay because of its stunning design and list of amenities offered to discriminating guests. 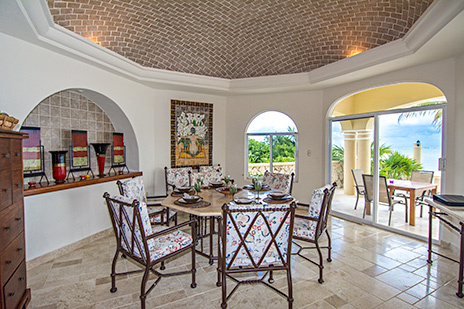 First floor of the Casa Paloma is open and airy. The living area features floor to ceiling windows stretching two stories high to give you true blue views of the pool, sea and sky. Dining area area seats 8 with additional seating for 6 at the breakfast bar in the kitchen. 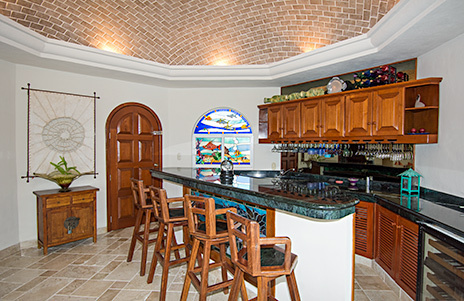 There is also a fully equipped bar with 4 stools off the kitchen and near the second living with semi-circle sofa and rattan arm chairs. 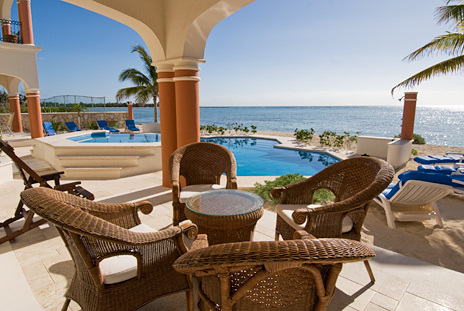 A multi-level pool is the focal point of the the oceanside patio area. Water cascades from the shallow paddle pool to the larger pool below it, creating not only a stunning sight, but a soothing sound as well. 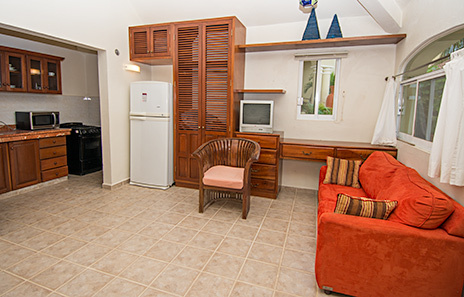 Three bedrooms are located upstairs. 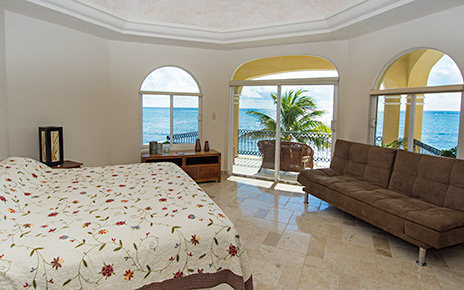 Master bedroom with ocean views, has a king sized bed and luxurious marble bathroom complete with Jacuzzi. 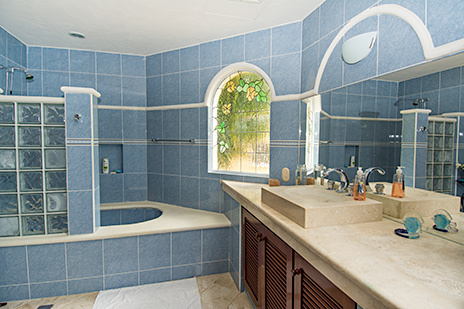 Two guest bedrooms each with a king bed are separated by a large bathroom which is shared between the two bedrooms. 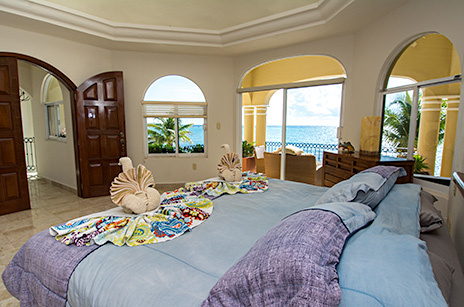 One of these bedrooms is oceanfront and the other overlooks the emerald jungle. 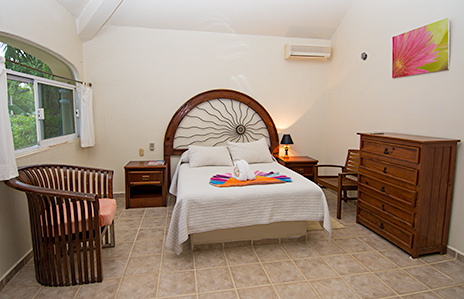 Finally, the air conditioned guest house is located in a separate casita by the main house. 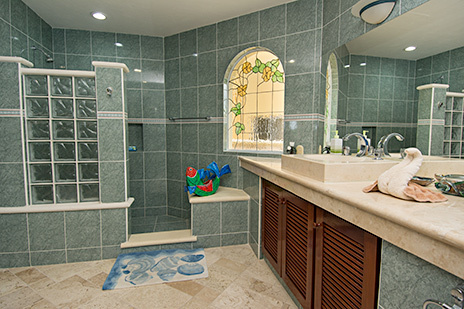 It has a queen-size bed, kitchenette and private bathroom; it also has a futon that can sleep 1 or 2 children. 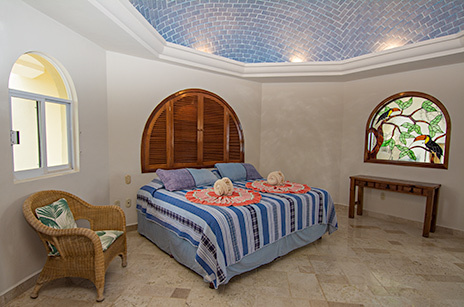 Casa Paloma is an exclusive villa promising a vacation of a lifetime. 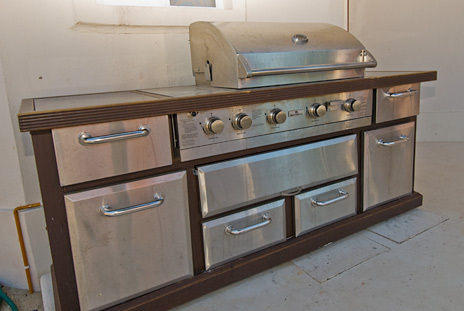 If you like to barbecue, you'll love this outdoor grill! 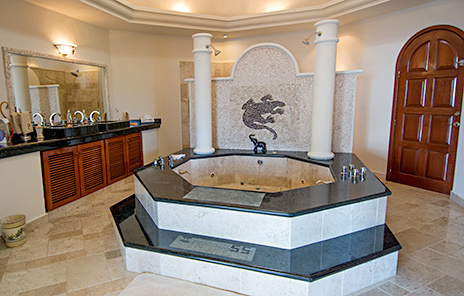 This is the master suite bath with 5-person jacuzzi!